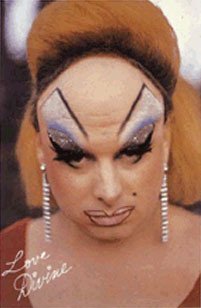 The drag queen and disco diva was born Harris Milstead but took Divine as a stage name after playing the character in a John Waters film, Multiple Maniacs. Best known for eating dog poop in the film Pink Flamingos. He grew up six houses away from John Waters and their friendship continued throughout their careers in show business. He had a brief stint as a singer and went on tour. Towards the end of his life he was trying to find work as a non-transvestite character actor, and was slated to appear as "Uncle Otto" on Married With Children.